… based in Alzenau, Germany is a global leader in providing isotopes in the form of ultra-pure substances for the semiconductor and nuclear industry as well as for agriculture and medical applications. We have been a reliable partner for long term demands of stable isotopes for more than two decades. We maintain our partnership with the major enrichment enterprises in the Peoples Republic of China, the Republic of Georgia and the Russian Federation. With our warehouses at Frankfurt Airport, Hamburg seaport and cooperation partners in USA, we are able to ship our isotopes within 48 hours to our clients worldwide. With our quality management (ISO 9001-2015, NUPIC) as well as third party analysis of our products, we guarantee our customers reliable services and high quality isotopes. … was established as a spin off company from NUKEM Isotopes GmbH in 2015. NUKEM Isotopes Imaging GmbH specializes in the supply of stable isotopes, which are used in the field of Magnet Resonance Imaging (MRI). Currently NUKEM Isotopes Imaging GmbH provides two isotopes, Oxygen-17 and Xenon-129, in different forms and enrichments. For further information, please download our brochures of the corresponding product or contact us directly. 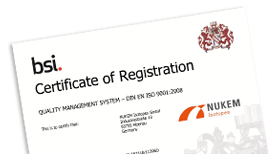 NUKEM Isotopes Imaging GmbH is ISO 9001-2015 certified and has established long term relationships with medical companies, who specializes in producing ultra pure products in compliance with cGMP regulations. This guarantees our customers in the medical fields a high quality and safe product. Foundation of NUKEM Isotopes Imaging GmbH, a 100% subsidiary of NUKEM Isotopes GmbH. 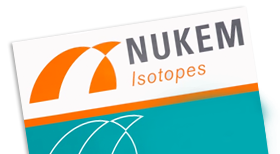 Foundation of NUKEM Isotopes GmbH on November 1st for further growth of Isotopes business. Exclusive Sales Contract between CPH (Institute of Stable Isotopes, Tbilisi, Georgia) and NUKEM for the supply of B-10, B-11, O-18, O-17 and N-15 isotopes. Diversification of NUKEM’s Research Reactor Group by adding stable isotopes for water chemistry of nuclear power stations to the trading portfolio. Foundation of NUKEM as one of the first commercial nuclear fuel companies in the world.